In addition to playing cards to your emberscape, you can also play cards to your “mode” pile, a faceup card that determines the current strategy you’re taking: protection (preventing your cards from being stolen), attack (collecting your cards as soon as the emberscape is full rather than at the start of your turn), hasty (collecting when you have at least 3 cards in your emberscape at the start of your turn), or greedy (drawing two cards instead of one). One of the interesting aspects of the game is that each card has a particular mode printed on it - so cards can be played to collect them or as a mode of play. Ben & Josh have also come up with a good way to track endgame in Ambyria: arcane cards. At the start of the game, players deal four cards face down to their side of the table. Each time you collect the points in your emberscape, you reveal one of those arcane cards. At the end of the phase when either player’s final arcane card is revealed, the game ends. The player with the most points wins. 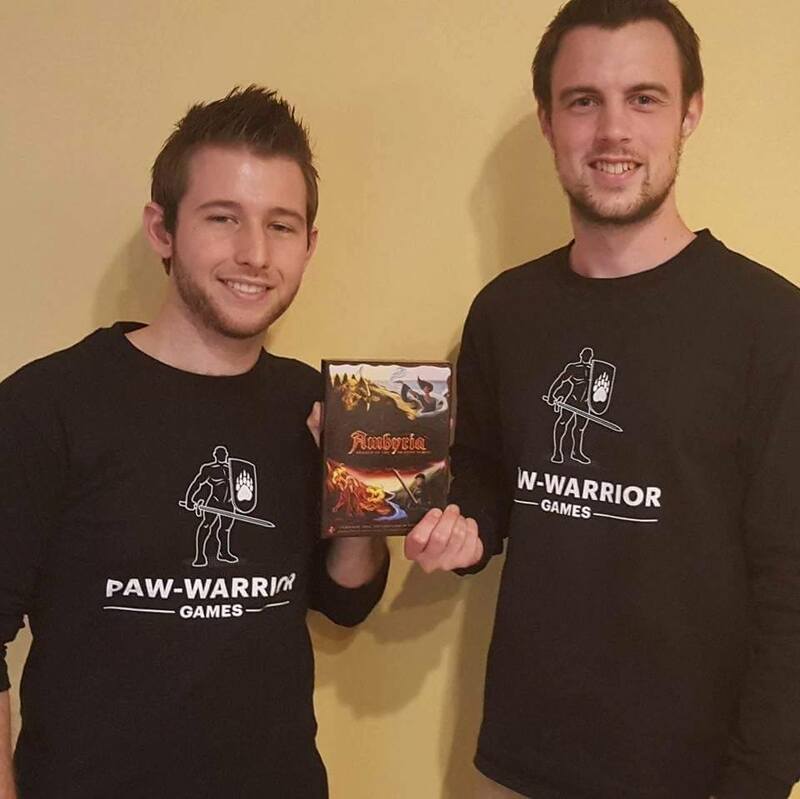 Here are Josh & Ben, creators of Ambyria. There are quite a few things I like a lot about Ambyria. The difference in modes - and the choice to change the mode or not at the start of your turn always feels like an interesting one. Do I want to leave myself open to attack - but collect my valuable points as quickly as possible? Or do I want more cards - and thus give myself more choices in the future? And is making that change worth the possible points that I’ll have to not earn from the card I play to the mode pile? In a broader sense, Ambyria packs many other good, interesting, strategic decisions into an inexpensive, small-box game. Though there is decidedly an element of luck in the game with respect to what you draw, the skilled player has a seemingly significant advantage over the unskilled one. 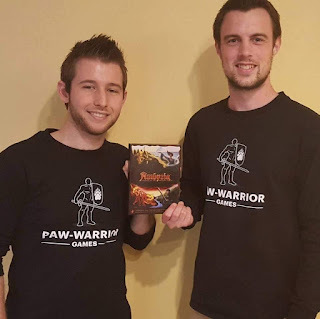 And given that each player has a pre-constructed deck (players can choose one of four balanced-but-not-identical decks), Josh & Ben have set everyone up to be competitive. Most importantly, Ambyria is a lot of fun in a quick, relatively easy-to-learn game. I’ve thoroughly enjoyed both of the games I’ve played, and I’m looking forward to introducing it to my gaming group soon. One of the issues that I have with the game is that the choice of whether to play a card for its ability or its point value isn’t there. In the game, the cards with effects that are generally more powerful are also worth more VP. If players were choosing between playing for ability or for points, this design decision would be spot on; however, since playing a card to your emberscape activates its ability and puts it where you can, eventually, collect it for points, I would have liked to see the more valuable cards have weaker abilities. Some of this problem, though, is mitigated by the fact that opponents can steal or destroy cards in your emberscape (provided that you aren’t in protection mode). So, if you put out a valuable card, your opponent might swipe it for themself. Still, the right choice, then, is usually to steal the both the most valuable and most powerful card from your opponent when given the chance. My other issue with the game, and it’s a nitpicky one, is the terminology of the “attack” mode. In this mode, you collect as soon as your emberscape reaches 5 cards rather than waiting until the start of your next turn, which doesn’t really relate to attacking your opponent. While it’s a small issue, the dissonance there gave me a few issues during my first game - and thus slowed down gameplay a bit. 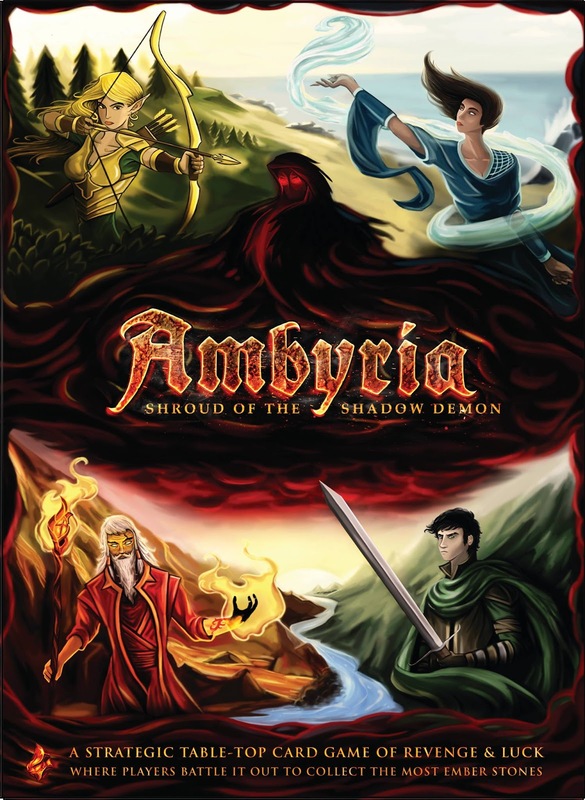 Those two issues aside, Ambyria is a fun, quick strategy game that’s well, well worth checking out!